ALLRUSSIAS - "Ready to Take All Power"
In the meantime events in Russia appeared to vindicate Lenin’s strategy. In April the Minister of Foreign Affairs of the Provisional Government, Kadet Miliukov, sent a diplomatic note to Russia’s war allies in which he reaffirmed his government’s determination to pursue the war against Germany till it could reach a ‘just peace’. The document was published in the popular press and provoked huge shows of public indignation in Petrograd and other cities. Miliukov was forced to resign from his post, together with Guchkov, the minister of war and the leader of the Octobrist party. In early May some ministerial posts in the Provisional Government were given to the leaders of moderate socialists, such as the founder of the Socialist Revolutionary Party Chernov, the Menshevik Tseretely and others, in order to restore the declining prestige of the bourgeois government. The Provisional Government became now a coalition cabinet. However, this had little effect on the nature and direction of its policies. In this situation Bolshevism was gaining in strength and popularity. Bolshevik Party membership began to rise. In February the Bolsheviks had only about twenty-five thousand members - far fewer than either the Mensheviks or the Socialist Revolutionaries. By May they had the support of most factory committees in the capital. By June the rise in Bolshevik strength was clear to everyone. At the first All-Russian Congress of Soviets of Workers’ and Soldiers’ Deputies held in that month the Bolsheviks had 105 delegates; the Mensheviks, 248; and the Socialist Revolutionaries, 285. At the Congress Lenin bluntly declared that his party was ‘ready to take all power’. This declaration was backed up by mass rallies, organized by the Bolsheviks in Petrograd and other major cities. These were held under the Bolshevik slogans of ‘All power to the Soviets!’, ‘Down with the war!’, ‘Down with minister-capitalists!’ and caused a new, June crisis of the Provisional Government. They showed that the Bolsheviks were now a serious political force in the capital. In June the government tried to rouse patriotic feelings with a huge military offensive on the southwestern front. The beginning of July, however, brought the news of the collapse of the Russian army’s advance there. On 4 July in Petrograd a half-million people gathered to demonstrate under the Bolshevik slogans. 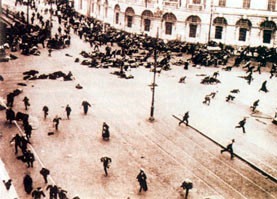 Some pro-Bolshevik army units in the capital also joined the protesters. On the eve of the demonstration a group of Bolshevik leaders had argued in favor of the removal of the Provisional Government by force. Lenin, however, advised caution arguing that the Provisional Government still had sufficient backing of loyal troops, that Russian provinces were not yet ready to support an insurrection, and that a premature rising could provoke a right-wing backlash strong enough to damage irrevocably the Party’s prospects of ever seizing power. In a heated debate the Party leadership had finally decided to scale down the protest to a peaceful rally. However, the presence of pro-Bolshevik army units among the protesters made violent clashes with the police and progovernment troops almost unavoidable. The rioting continued for two days. As a result of the spontaneous exchanges of fire, over four hundred people were killed or wounded. Eventually, the progovernment troops suppressed the insurrection. The Provisional Government resorted to harsh measures to restore order. Marshal law was declared in the capital. Some military units were disarmed and removed from the city. The blame for the uprising was put squarely on the Bolsheviks. Their newspaper Pravda was closed, and documents were published claiming that the Bolsheviks were receiving money from the German enemy. Orders were issued to arrest Lenin and a number of other Bolshevik leaders on charges of being German agents. The Bolshevik leader had to leave Petrograd and go underground on the Russian-Finnish border. 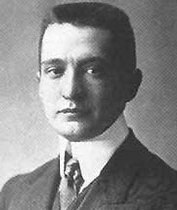 In July a Second Coalition Provisional Government was formed with Alexander Kerensky (1881-1970), a moderate socialist, assuming the position of prime minister to replace Prince Lvov who resigned. The Socialist-Revolutionary and Menshevik leaders of the Soviets hailed the new coalition cabinet as ‘a government of the salvation of the revolution’ and offered its unconditional support. In a desperate attempt to stem the wave of mass desertions and bolster up military discipline, the Provisional Government reintroduced death penalty at the front, set up military tribunals and re-established military censorship. It now took the reigns of power firmly in its hands. The period of ‘dual power’ came virtually to an end.